Have you ever heard the saying, we are “products of our environment”? Feng shui is all about harnessing the positive flow of energy in our environments to live happier days in and out of your home. After all, a mess at home is thought to bring a mess to all aspects of your life. With an increased affinity toward this ancient Chinese discipline sweeping through the U.S., homes, offices and even hospitals have adopted feng shui into their designs. Simple feng shui basics like switches in furniture arrangement, color schemes and the positioning of certain objects combine to reenergize and improve the feel of any room of your home. Follow our feng shui beginners guide with expert tips from Katie Weber of Red Lotus Letter to create a peaceful space to call your own. First and foremost, feng shui beginners, eliminating excess stuff is essential to creating balance in your space. Clutter and disarray overwhelms the energy of any room. Remove objects that collect dust, serve little purpose or simply don’t belong, and you will feel a weight lifted off your shoulders. Before you begin decluttering, take advice from the experts in our Ridiculously Thorough Guide to Decluttering Your Home. Incorporate living things to feng shui your home quickly and easily. Introducing a tableside plant will not only freshen the air, but add a touch of greenery to energize your space. Even a simple branch in a pretty vase, a bouquet of fresh flowers or a little potted plant will bring your room to life. Lighting is the key to setting the mood. To achieve a feng shui family room or bedroom, incorporate light from both natural sources and light fixtures. Bring warmth to your space by simply lighting a candle. Install track lighting in areas where natural light is missing. Place furniture in a people-focused way that promotes conversation and face-to-face interaction. For example, place chairs directly facing your sofa, rather than opposing angles. Also, avoid placing all pieces of furniture directly against walls. “Furniture that is pulled away from walls to allow energy to flow in the home smoothly is also a good design point,” Weber suggests. To feng shui your home, you must also be mindful of the exterior living space. 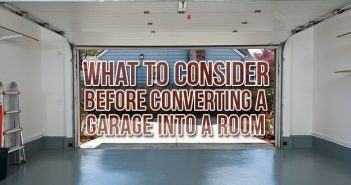 “Your home’s energy starts at the front door and goes inwards,” Weber explains. Boost your home’s curb appeal with a freshly painted door, lush landscaping and a well-manicured lawn. Create an outdoor space with pops of greenery where you can entertain guests and enjoy the outdoors. When you first return home, your entryway should greet you with positive energy. Welcome guests to a feng shui space that is representative of who you are. Place a bench in the entryway to create an inviting vibe. Keep shoes, umbrellas and jackets organized or tucked away in a closet to make a desirable first impression. Let’s face it. Nobody wants to see dishes piled up with yesterday’s cheesy macaroni caked to the plate. Keep your home clean and organized. Think of cleaning your home as scrubbing negative energy from your living space. 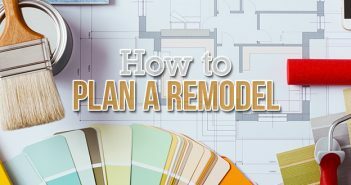 Beyond that, don’t let little projects like leaky faucets, broken handles or peeling paint pile up. Take them on as they come. Sustaining the appearance of your home and landscaping brings good energy, good health and good fortune. Welcome these feng shui beginners tips into any room and share the transformation with us! Feeling inspired to redesign your space into a zen-like retreat? 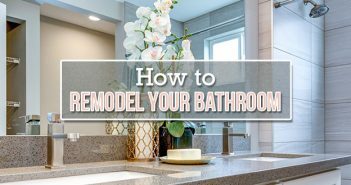 Take a look at our Home Project Guides to learn how to budget for a bathroom remodel, efficiently declutter your home or even frame a wall. Have a few feng shui tips of your own? Share them in the comments below!